UPDATE, 27 April 2016, 12.15pm: In a statement to Alice Springs News Online Commander Danny Bacon advises that additional information indicates that the offenders in this incident are adults and not youth as was first reported. Investigations are ongoing, with statements being obtained and CCTV reviewed from various locations in the area. Anyone with any further information in relation to the matter should contact Police on 131444. No arrests have yet been made over an incident that saw a security guard hospitalised in an attack by a 30-strong group in the early hours of Saturday atop Anzac Hill. 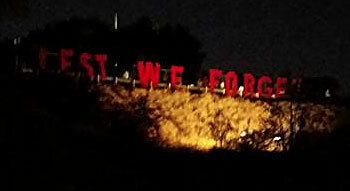 In the melee a poppy-filled ‘Lest We Forget’ sign, raised in anticipation of the Anzac Day dawn service, was vandalised: the word ‘Lest’ was toppled over, leaving the sign to read ‘We Forget’ (images above and below from Facebook). And bystanders who came across this group were apparently also hurt. Alice Springs Town Councillors were meeting at 7am Saturday, to continue their deliberations on the 2016-17 budget. After a phone call, they had a visit from Assistant Police Commissioner Jeanette Kerr to discuss the disturbance. At last night’s end of month meeting Councillor Eli Melky called on his colleagues to think beyond “immediate mitigation” of this kind of “anti-social behaviour”: “I won’t call them youth issues,” he said, although he did later slip into talking about youth, as did everyone else. Councillors weren’t actually given specific information about how many of the 30 may have been youth, that is under 18, as Cr Melky acknowledged. Weapons were involved, “hammers, crow bars, whatever else”. 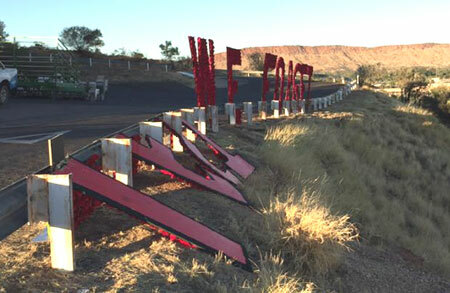 He had observed the range of security agencies, operating out of Alice Springs, represented at the Anzac Day laying of the wreath: agencies that “look after the security of the world but we can’t seem to handle 30 young people that are running riot in the middle of Alice Springs”. He called on council to do some thinking about a long-term, sustainable approach to the problem, while keeping “calm heads” and being conscious of the “difficult social issues that exist out there”. Cr Chansey Paech had earlier in the meeting asked about progress on a coordinated approach for youth services during the upcoming school holidays. And earlier in the month he had queried to curtailment of the Youth Patrol Service, which picks up young people in the streets at night and returns them to their homes. It had been reduced from a seven nights per week service to five, then three. He was told that the seven nights per week service will be restored for the school holidays and that council will attend an “important meeting” on 10 May of all governments and stakeholder agencies to coordinate a program of events for the period. Cr Jacinta Price noted that the attack on Anzac Hill had occurred between 2 and 4 am, outside the hours of the Youth Patrol Service. She said that the homes the youths came from are “probably less safe than the streets” and she would support lobbying for a youth drop-in centre so they would have somewhere to go. Cr Brendan Heenan said it was not a problem that could be solved last night. He asked for a council forum to be dedicated to the issue, involving police and youth services. Cr Jade Kundrenko said she had been “really disturbed” to hear from the Assistant Commissioner about Saturday’s events, although they are not isolated. She told the Assistant Commissioner about intimidating incidents as she had left council chambers after meetings, when there were large groups of young people gathered on the council lawns. However, in working towards a long term strategy on how the town is going to manage anti-social behaviour, Cr Kudrenko said the police are not the right agency to take the coordinating lead. “The police’s role is to maintain law and order” which is the “end game” of this issue, she said. “We need a more proactive response to ensure that over time police do not even need to be involved.” She saw the Chief Minister’s office as best placed to take the lead. She said the Youth Patrol Service may need more than one bus as it certainly could not have catered for the 30 youths of Saturday’s incident. She also expressed her support for a drop-in centre. Mayor Damien Ryan said he had raised the incident with the Lhere Artepe board at a meeting with them on Saturday afternoon. He said they were very concerned and wanted to be involved in further discussions. One such discussion took place yesterday, attended by the CEO Rex Mooney, who was going to brief councillors about it during the confidential section of the meeting. Once again it is all words and no action. ElI, if you say something it needs to be followed by assertive action. The police do a good job but need more power to control these situations. Even when they do apprehend these people, minimal punishment is given. As for the security guard, would it not have been commonsense to ring for back up? He obviously needs more training. If these people had been drinking, they will hide behind mental health. Shame, Shame, Shame!!! The diggers at ANZAC and the Desert Rats of Tobruk must be weeping in their graves. Shame not only to the perpetrators of this despicable act but to those who must know who some of them are and have not come forward with necessary information. LEST WE FORGET!! Indeed. Sorry Jade, if the Chief Minister’s office is the answer it was a stupid question. Jacinta, from our experience in Tennant a drop-in centre is only somewhere they go to to grab a drink and a feed then co-ordinate the next crime spree and compare notes on which houses are unattended. I am seeing a lot of election year talk in this story but not too many who genuinely want to find solutions. When Eli sounds like the only voice of reason, you know it’s not going to end well.